Langford is a city of contrasts; and its varied personality contributes to its charm. It is possible to enjoy quiet, contemplative activity on the many walking paths and nature trails; but the Luxton Pro Rodeo is a hugely popular event every spring, and the new addition of training facilities for Rugby Canada in City Centre Park seems destined to attract throngs of sports lovers. Langford is justifiably proud of its status as the economic and business hub of the Capital Regional District. This West Shore community is known for its innovative and consistent approach to growth and development, and has become a model for other communities because of its commercial zoning policies, as well as the envy of residential developers due to an emphasis on energy efficiency and affordability. A model for planners and officials throughout the province, Langford lives up to its reputation as a progressive leader. Located in the foothills of Mount Finlayson on Vancouver Island’s southern tip, Langford is close enough to Victoria to allow an easy commute and convenient access to the mainland as well as the world. Its residents also appreciate the local concentration of wholesale and retail enterprises, as well as light industrial and myriad small business endeavors. 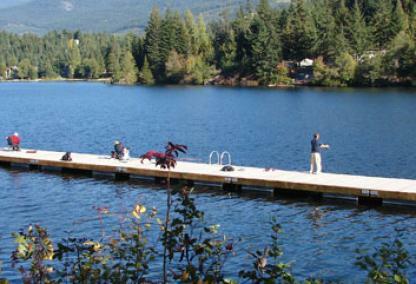 Its location, with portions of three lakes within its area, is perfect for leisure-time activities as well. Goldstream Provincial Park is located here, as is a part of Thetis Lake Regional Park. One can indulge other passions here as well, from motor racing at the Western Speedway to a Skatepark, to hockey, lacrosse and curling competition at Bear Mountain Arena. Family fun is guaranteed throughout the year also, with numerous recreation centers including a tree-to-tree outdoor obstacle course. There is even free Wi-Fi offered in many areas in Langford.